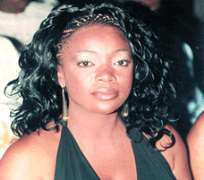 Just a few years ago, Nollywood actress and screen diva, Bimbo Akintola, was in a passionate romance with Fela Wannabe, Dede Mabiaku. Along the line, the relationship began to falter when people, in Bimbo's interests, intervened by revealing that Bimbo had begun to smoke marijuana since she got involved with Dede. Trust Bimbo, she denied vehemently that she was smoking marijuana and she has been vindicated to date because there hasn't ever been any picture of her caught in the act. But according to recent public confessions of Bimbo and Dede, the pair are back in each other's arms. We only hope they will finish this time what they started then.